INTRODUCTION: Artesunate (ARTS), (3R, 5aS, 6R, 8aS, 9R, 10S, 12R, 12aR)-Decahydro-3,6,9-trimethyl-3,12 epoxy-12 H-pyrano [4-3-j] 1,2-benzodioxepin-10-ol hydrogen succinate (Fig. 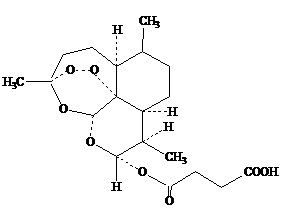 1), is a semi-synthetic derivative of artemisinin, a naturally occurring sesquiterpene endoperoxide. It has been shown to be highly active against multi – drug – resistant Falciparum malaria in several regions dealing with high resistance rate against the classic antimalrials 1,2. ARTS have a rapid onset of therapeutic effect after extensive biotransformation of artesunate into dihydro artemisinin which is likely to provide beneficial therapeutic outcomes in severe or cerebral malaria 3-5. 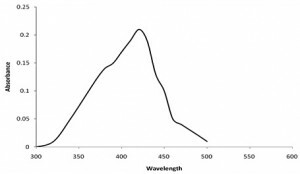 It is particularly difficult compound to detect and identify by standard spectrophotometric methods, has a relatively low molar extinction coefficient, and has no distinct UV/visible spectra or fluorescent properties (Fig. 2). Therefore the reported detection systems were electrochemical detection 6-8 derivatization 9 and post – column degradation before UV detection 10, 11 evaporate light scattering detection 12 and more recently MS 13, 14. However most of them were required for pharmacokinetic assay, whereas quality control needed more simple method like spectrophotometry. Antimalarials such as chloroquine and sulfadoxine have particular chemical groups that react with certain compounds to give colour reactions 15,16. Although ARTS does not possess these reactive groups, we discovered that it undergoes dehydrogenation by reacting with acetic anhydride and sulphuric acid and a stable unsaturated system capable of absorbing light is produced. A visually distinct yellow product is produced which absorbs visible light at 420.6 nm with a positive correlation between absorbance intensity and ARTS concentration. 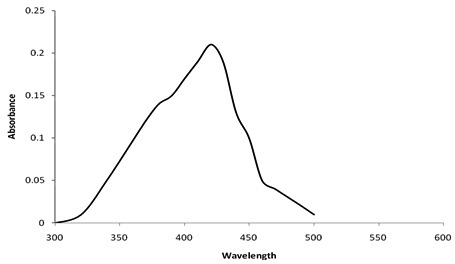 Apparatus: A Schimadzu UV-Visible 1201 Spectro-photometer with 1-cm matched quartz cells was used. All weighing were done using Schimadzu electronic balance (10 mg sensitivity). Materials and Reagents: Artesunate, reference standard was kindly gifted by Zydus Cadila, Ahmedabad. Acetic anhydride, Methanol and Sulphuric acid were purchased from Merck Chemicals, Mumbai, India. Double distilled water was used throughout the work. Falcigo (Zydus Cadila), TeSunate (McW Health Care [P] Ltd) and Famal – 50 (Navil Laboratories) each labelled to contain 50 mg were purchased from the local market. General procedure: The procedure involves formation of yellow coloured product by reaction of ARTS with acetic anhydride and sulphuric acid by heating at a temperature of 100°C for 15 minutes. 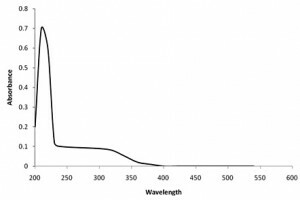 The absorption spectra of coloured complex under optimum conditions were scanned in double beam mode against a reagent blank over the range 300-800 nm. Characteristic λmax value was obtained at 420.6 nm (Fig. 3). Experimental conditions were established by varying each parameter individually and observing the effect on the absorbance of the coloured species. All the spectral characteristics, as well as measured or calculated factors and parameters are summarized in Table 1. 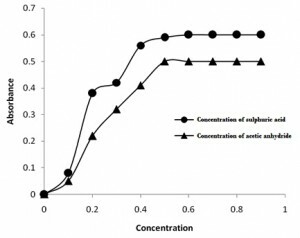 Effect of Reagent Concentration: The addition of 0.5 mL acetic anhydride and 0.6 mL concentrated sulphuric acid was sufficient to obtain maximum and reproducible absorbance values for various concentration ranges of ARTS. Lesser amounts resulted in incomplete reaction. Increased amounts had no effect on complex formation (Fig. 4). Effect of Temperature and Heating Time: Higher temperature was required to accelerate the reaction. The colour intensity increased with increasing temperature and maximum absorbance was obtained following heating on a water bath at a temperature of 90 – 100°C for 15 minutes. Further heating caused no appreciable change in colour. The complex obtained was stable for more than three hours. Linearity and Sensitivity: For assessing linearity, 10 mg ARTS reference substance was accurately weighed; 0.5 mL of acetic anhydride and 0.6 mL of concentrated sulphuric acid was added drop wise with the temperature maintained below 10°C. The solution was heated on a boiling water bath for 15 minutes, brought to room temperature and volume was made to 100 mL with methanol to furnish a concentration of 100 µg mL-1. From this stock solution, aliquots were suitably diluted with methanol to give a concentration of 4-60 µg mL-1. The calibration curve was constructed by plotting absorbances as a function of corresponding concentrations. The regression equation for the results was derived using least square method. Beer’s law plot was linear with very small intercept (0.005) and good correlation coefficient (0.9994) in the concentration range of 4 – 60 µg mL-1. The limit of detection (LOD) and quantitation (LOQ) were determined using the formula: LOD = 3.3 σ / S and LOQ = 10 σ / S where σ, is the standard deviation of the response and S is the slope. The LOD and LOQ were 0.72 µg mL-1 and 1.8 µg mL-1 respectively. where Pt is the total drug concentration measured after standard addition, Pi is the drug concentration in the formulation sample, Pa is the drug concentration added. 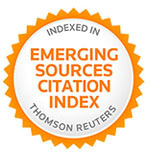 Er = [(Found – added) / added] × 100. Recovery value from method followed ranged from 98.16 to 99.67 (Table 2). Intraday and inter-day precisions were assessed using three concentrations and three replicates of each concentration, the relative standard deviations were found to be very small, indicating reasonable repeatability of the proposed method as shown in Table 3. *Average of determinations carried out in triplicate. Specificity: The specificity of the method was investigated by observing any interference encountered from the common excipients of the pharmaceutical formulations. It was found that these compounds did not interfere with the results of proposed method. Robustness: Robustness was examined by evaluating small variations in different experiments conditions such as heating temperatures (±2°C), volume of reagents (±0.1 ml) and working wavelength (±1 nm). Three replicate determinations at six different concentration levels of drugs were carried out. The within-day RSD values were found to be less than 1% indicating that the proposed method has reasonable robustness (Table 4). Application of proposed assay in the analysis of pharmaceutical formulations (Artesunate tablets): Ten tablets were accurately weighed and powdered. A quantity equivalent to 10 mg ARTS was dissolved in 20 mL methanol in a 100 mL calibrated flask. The solution was warmed on a water bath maintained at 70°C for few minutes to ensure effective stability. The solution was allowed to attain room temperature, diluted to volume with methanol to furnish a concentration of 100 µg mL-1. An aliquot of 1.0 mL from above solution was pipetted out into 10 mL volumetric flask. The solvent was removed by evaporating it in a water bath maintained at 80 °C, cooled, 0.5 mL of acetic anhydride was added and kept in ice bath. To this 0.6 mL of sulphuric acid was added and heated at 100°C for 15 minutes. The solution was allowed to attain room temperature and diluted with methanol (10 µg mL-1). The absorbance was measured at 420.6 nm. The average percent recoveries of different concentrations were based on average of five replicate determinations. The results obtained were in good agreement with those obtained by reference method (Table 5). *Average of nine determinations, three each with starting powder amount equivalent to 10, 25 and 50 mg artesunate. CONCLUSION: The proposed spectrophotometric method provided simple, reproducible and accurate method for determination of ARTS. The established method was validated and applied to determination of studied drug in their dosage form without interference from common excipients. The advantage of the method being less time consuming and do not require various elaborate treatments and tedious extraction procedures in addition to satisfactory sensitivity and reproducibility as well as convenience and simplicity. Klayman D., Science., Qinghaosu (Artemisinin): An antimalarial drug from China 1985:228, 1049. Karbwang J, Na-Bangchang K, Congpuong K, Thanavibul A and Harinasuta T., Clinical and Drug Investigation., Pharmacokinetics of oral artesunate in thai patients with uncomplicated falciparum malaria 1998:15, 37. Benakis A, Paris M, Loutan L, Plessas CT and Plessas ST., American Journal of Tropical Medicine and Hygiene., Pharmacokinetics of artemisinin and artesunate after oral administration in healthy volunteers 1997:56, 17-23. Davis TME, Phuong HL, Ilett KF, Hung NC and Batty KT., Antimicrobial Agents and.Chemotherapy., Pharmacokinetics and pharmacodynamics of intravenous artesunate in severe falciparum malaria 2001:45, 181. Barudell LB and Fitton A., Drugs., Artesunate: a review of its pharmacology and therapeutic efficacy in the treatment of malaria 1995:50, 714. Zhou ZM, Anders JC, Chung H and Theoharides AD., Journal of Chromatography., Analysis of artesunic acid and DHA in blood by HPLC with reductive electrochemical detection 1987:414, 77. Na-Bangchang K, Congpuong K, Hung LN, Molunto P and Kargbwang J., Journal of Chromatography B, Simple HPLC with electrochemical detection for simultaneous determination of artesunate and DHA 1998:708, 201. Navaratnam V, Mordi MN and Mansor SM., Journal of Chromatography B., Simultaneous determination of artesunic acid and dihydroartemisinin in blood plasma by high-performance liquid chromatography for application in clinic pharmacological studies 1997:692, 157. Zou AQ, Xie M and Luo XC., Journal of Chromatography., Determination of artesunic acid after chemical derivatization with o,p-nitrobenzyl N, N’ diazopropyl isourea by HPLC with ultraviolet absorption 1987:410, 217. Batty KT, Davis TME, Thu LT, Binh TQ, Anh TK and Ilett KF., Journal of Chromatography B., Selective high-performance liquid chromatographic determination of artesunate and α- and β-dihydroartemisinin in patients with falciparum malaria1996:677, 345. Taylor RB, Awad MI, Reid RG and Moody RR., Determination of sodium artesunate in plasma using ion pairing high performance liquid chromatography., Journal of Chromatography B 2000:744, 415. Christen P and Veuthey JL., Current Medicinal Chemistry., New trends in extraction, identification and quantification of artemisinin ad its derivatives 2001:8, 1827. Ortelli D, Rudaz S and Congnard E., Chromatographia., Analysis of Dihydroartemisinin in Plasma by Liquid Chromatography-Mass Spectrometry 2000, 52:445. Naik H, Murry DJ, Kirsch LE and Flecknestern L., Journal of Chromatography B., Development and validation of HPLC-MS assay of determination of artesunate and DHA in human plasma 2005:816, 233. Mount D, Nahlen B, Patchen L and Churchil F., Bulletin of World Health Organisation., Adaptations of the saker-solomons test: simple, reliable colorimetric field assays for chloroquine and its metabolites in urine 1989:67, 295. Green MD, Mount DL and Todd GD., Analyst., Determination of sulfadoxine concentrations in whole blood using C18 solid-phase extraction, sodium dodecyl sulphate and dimethylaminocinnamaldehyde 1995:120, 2623. Meena S and Sandhya SM: A Novel Method for Spectrophotometric determination of Artesunate in Pure Form and Tablets. 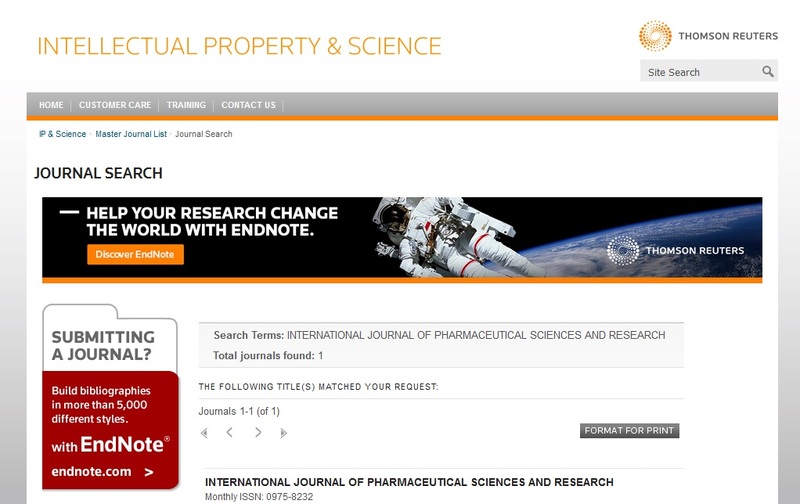 Int J Pharm Sci Res. 3(12); 5111-5115.